Location: About 100m E of park entrance at junction of Waterloo Road and Stow Park Road. Grey-brown stone, red terracotta dressings and string courses, red tiled roof. Dutch C17 style. Pavilion W entrance has shaped gable with steep pediment (ball finial), 2 round-headed windows below separated by pilaster. Two-storey terracotta pilasters support frieze with acanthus scroll (ball finials to ends). Large 5-light round-headed first floor window over closed balustrade with urn balusters. Round-headed entrance doorway flanked by terracotta artisan mannerist style pilasters supporting steep pediment with heraldic shield. At first floor level, outer bays have corner pilasters. East front facing terrace similar but instead of first floor window has open loggia behind which is 4-light mullioned and transomed window with stained glass; simple square-headed entrance doorway. To each side of the pavilion is a conservatory. Stone and terracotta plinth. Upper parts (heavily restored) in wood and glass. Advanced central gabled bays to front and rear (doorways to front), hipped glazed roofs above which are ventilators with smaller hipped roofs. Beyond conservatories, to each end, public convenience in matching materials. 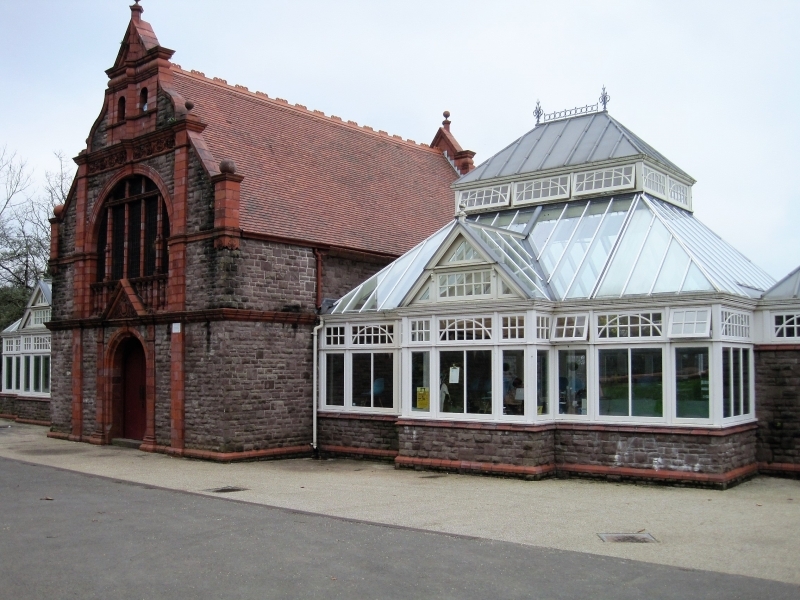 Listed as prominent building in Belle Vue Park conservation area which is a Grade II entry in Register of Parks and Gardens of Special Historic Interest in Wales. Group value with adjacent terracing. Below, and to E of pavilion which is about 100m E of park entrance at junction of Waterloo Road and Stow Park Road.